Introduction: Liz has lived, worked, and played in the White Mountains for the past decade. As a teacher, writer, and naturalist she leads hikes and educational programs for all ages. She has taught environmental science and natural resources to students in middle school, high school, and college. Liz is passionate about the natural and cultural history of New England. Show her a tree or flower and she can tell you what it is. She is an active volunteer with the Appalachian Mountain Club as a trail adopter, volunteer naturalist, and Conservation-Education Co-Chair for AMC’s New Hampshire Chapter. Résumé: Liz has completed multiple rounds of the 48 New Hampshire 4000-footers, including all the peaks in winter. She went on to discover that Vermont and Maine have great mountains too, and completed the 67 New England 4000-footers, as well, twice, including in winter. That required some multi-day expeditions to Baxter State Park, one of her favorite places. 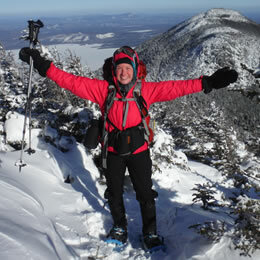 She then started exploring off-trail and has completed the New England Hundred Highest. Liz is an alum of the AMC-NH Chapter’s Winter Hiking Series and the AMC Winter School and is currently pursuing her Class 1 Leadership certification. She also enjoys running, bicycling, paddling, cross-country skiing, and backpacking. The Appalachian Trail is her second home, where she answers to “Teach.” Liz has section-hiked 450 miles of the Appalachian Trail (AT) in New Hampshire and Maine and is always looking to share some trail magic. A: For me, the White Mountains were love at first sight. At ten years old I was invited on a trip up north with a friend, and I still remember the feeling of awe the first time I laid eyes on Cannon Cliffs. On the way home I vividly remember looking out the back window with my nose pressed to the glass as Franconia Notch grew smaller in the distance. I couldn’t take my eyes off of those peaks. I spent the better part of two decades daydreaming about the Whites and going back at every opportunity, until one night in 2008 the mountains came to me in a dream. The next day I was on the phone with a realtor, and less than two months later I moved halfway across the country to start my new life in the Whites. I never looked back. A: I wasn’t always a hiker. I summited my first 4,000-footer in high school, and it was one of the hardest things I’d ever done. I cried the whole way down. It would be almost a decade before I tackled another one. At first, hiking was only something I did a couple of times a year. In 2010 I decided I wanted to get back in shape, and I needed a goal. I had heard of peak-bagging, but I thought it seemed silly to hike peaks for the sake of a list. However, I found it to be the motivation I needed to get out of bed on a Saturday morning and hit the trail. In 2013 I finished my 48 White Mountain 4,000-footers, and in 2015 I completed my Winter 48 and New England 67. By that point it had become an obsession, and now I’ve just completed my New England Hundred Highest, with plans to do the list in winter as well. A: I have a magnet on my fridge with one of my favorite quotes: “Do the thing you think you cannot do.” If something scares you a little bit, that is all the more reason to go for it. Stretch yourself beyond your comfort zone. You won’t regret it. A: The trails that no one knows about, at the times when no one goes there, are the most magical places in the Whites. I love hiking in remote parts of the Kilkennys, the Mahoosucs, and the Crescent range, or waiting to hit the more popular peaks by starlight or in the dead of winter when I have them all to myself. Always take the path less-traveled… unless it’s covered in 2 feet of fresh snow. Then by all means follow someone else’s tracks!.